It is under kofi Annan, when he was Secretary General of the United Nations, that the split of Cote d’Ivoire between a rebel North and a constitutional South got sanctified. At the time, Kofi Annan was under pressure by the Bush administration to show patte blanche on the “oil for food” program and France needed to regain control of the richest French-speaking African country that was progressively distancing itself from Paris under President Gbagbo’s leadership. Chirac and Annan had something to give each other: Annan needed Paris’s support to fend the American onslaught and Chirac needed the United Nations to weaken Gbagbo. Annan’s/the UN’s sanctification of the Northern rebellion in Cote d’Ivoire tells a compelling story: While Africa should be proud of its sons of daughters who have “made it” on the global stage, on the other hand, Africa should remain extremely wary of the petite bourgeoisie that has been reared in the nurseries of such organizations as the United Nations, the World Bank, and the IMF, a petite bourgeoisie whose interests lie in the maintenance and continuance of Africa’s enslavement. In 1997 the world and Africa in particular greeted with much elation the appointment of the first sub–Saharan African, Ghanaian Kofi Annan, as head of the United Nations. Annan even received some praise and enthusiastic wishes of success from very unlikely supporters. Then senior vice president of the American Enterprise Institute, John R. Bolton, who would later become one of Annan’s fiercest critics, had this to say of Annan’s “win” over Tanzanian Salim A. Salim. 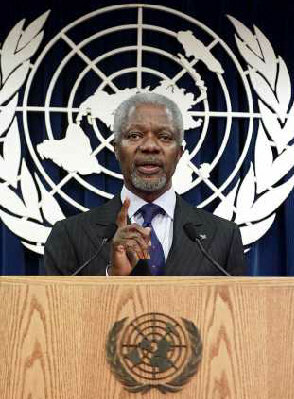 “The winner, Kofi Annan, was certainly preferable to Salim. Virtually all Annan’s career has been within the UN system, frequently in management and personnel positions. Few know the “system” better than Annan. He is therefore in the best possible position to deliver on reform, for bureaucratic trials, jargon and obfuscation are not likely to distract him if he is engaged. From January 1, 1997, forward, the world can judge his performance.” Could it be that the “system” to which Bolton was referring was what Stefan Halper named the United Nations’ “unholy trinity of waste, fraud, and abuse,” for indeed the world got to judge Annan and the verdict was resoundingly depressing? Truly, “a kleptocratic culture of non-accountability at home was transferred to the world body.” Annan managed the United Nations as a traditional Ghanaian village chief would manage his family plantation, that is, with no regard to transparency and good governance, but rather with particular propensity for nepotism, dereliction, and corruption. Under Annan’s predecessor, Boutros Boutros-Ghali, corruption, which was rampant in the United Nations, was thought to have reached its peak. However, Annan, who had been waiting for years in the antechamber of power, in the shadow of Boutros-Ghali as under-secretary general of the United Nations, was going to prove the critics of his boss wrong even before he had his chance to preside over the destiny of this most money-hungry institution. In a feat of pathological perfectionism Annan was going to take corruption to its uppermost eruption and claim for himself the palm of the world’s shadiest official. For Annan, how better could he claim the center of capitalism than to accumulate capitalism’s most valued assets, that is, money? So, when under his auspices the United Nations had the opportunity to administer the Oil-for-Food program, a program with a capital five-fold the United Nations’ own budget, Annan sought illegal means to hoard as much as he could of these funds either directly or indirectly. Indeed, in the aftermath of the 1991 Gulf War, the United States had imposed a series of trade embargoes on the Saddam regime. However, as is well known, sanctions imposed on despots have generally been circumvented by the governing classes they are meant to squeeze and have usually brought hardships on the ordinary people. To prevent this pattern from repeating itself in Iraq, the sanctioning authority allowed Iraqi oil to be sold, provided that the takings of the sale should be managed by the United Nations and utilized to buy food and humanitarian supplies for the people of Iraq and to fix the destroyed infrastructures of the country. In 1996, Kofi Annan was charged by Boutros-Ghali to administer the Oil-for-Food program, which was spasmodic at the time. Among the expert brokers that Annan brought in to make the program effective were his own son Kojo Annan and infamous Robert Mugabe’s nephew Leo Mugabe. Within seven years, the Annan dream team for the management of the Oil-for-Food program was able to reorient and embezzle billions of dollars with the complicity of Saddam, and this grand theft “would have succeeded without a hitch had not Saddam Hussein’s regime been overthrown and the Oil-for-Food program been transferred in all its mysterious splendor to the U.S.-led coalition in Iraq.”Of the 67 billion dollars that the export of oil generated between 1996 and 2003, Annan’s head of humanitarian program, Benon Sevan, before retiring to his 1.5-million-dollar mansion in New York, was able to report “31 billion in supplies of food and medicine delivered to the Iraqi people, leaving $8.2 billion in humanitarian goods still to be delivered…. $3 billion had gone in development funds to rebuild Iraq.” What of the rest? Well, in this age of digitized information, the United Nations internal managers/investigators for the Oil-for-Food program were sorry to inform the world that with the bombing of Baghdad by the coalition troops, important documents pertaining to the program got lost—as if the headquarters of the United nations were located in Saddam’s personal palaces; as if the United Nations, this over-budgeted institution, were still keeping records on first-century scrolls. In fact, “[t]he Oil-for-Food scandal is a potent indictment of the way business is done at the UN Secretariat. It represents the ongoing impeachment of the UN system, a symbol of continuing massive corruption involving the theft of close to $11 billion in revenues…. In fact, this recent scandal is not an aberration at the UN. It forms part of a pattern that can be considered the norm.” Where else than at the United Nations, the World Bank, and the IMF, these cradles of world corruption, could the black slaver fulfill his dream of tending exponentially toward the glittering center of white bliss? Where else than there could he accumulate the fastest possible that which allows him to mark his difference from the bottom billion crouching in the rural poverties of Africa and Asia? Where else than there could he amass the necessary assets that would make him a modern man in the urban space, in the company of the white? Annan’s attitude is symptomatic of the black elites’ perfectionist superfluity. The African petite bourgeoisie reared within such world organizations as the UN or the IMF, affected by inferiority complex, and that “pander[s] to Western opinion.” is on a binge for praise. Alassane Ouattara belongs to that class of approval seekers, and he would do anything to please the West and to avoid the West’s reprimand. Laurent Gbagbo does not fit the mold of France’s black governors as represented by Bokassa, Bongo I, Compaoré, Biya, Nguesso or Ouattara. The latter has been exposed as a vile politician that is more concerned about protecting the interests of his imperialist masters than ensuring and safeguarding the welfare of the Ivorian people, a people that has vowed never to bend to the imperialist pressure. His multiple calls for a popular uprising since 2002 and his attempts at coups d’état have repeatedly failed. His Occidental masters, however, are resolute to put him on the throne in spite of the people’s resistance. This sets the stage for another African calamity. Le 20 juillet 2012, la milice ethnique d’Alassane Dramane Ouattara, escortée par les FRCI et les chasseurs (dozos) convertis à l’épuration ethnologique de Dramane Ouattara, a fait irruption dans le camp de Nahibly, où 5000 Wê chassés de leurs terres avaient cru trouver refuge sous la « protection » des casques bleus. Là, sous le regard impassible des soldats de l’ONU, les miliciens de Ouattara ont détruit 90% des infrastructures du camp, massacré 13 réfugiés et blessé des dizaines d’autres. Dans la vidéo ci-dessous, deux femmes qui ont miraculeusement échappé au massacre des miliciens de Ouattara essaient de retrouver, l’une sa mère, et l’autre ses enfants dans les décombres encore fumantes du camp dévasté. L’évidence montre de plus en plus que non seulement l’attaque par la coalition FRCI-dozos du camp de réfugiés Wê de Nahibly était planifiée par les barons du RDR, mais aussi que, dans un élan des plus répugnants, dans un geste des plus inhumains, les autorités du régime génocidaire étaient aux premières loges pour assister en spectateurs privilégiés au massacre des Wê. Une vidéo postée récemment sur Facebook (voir ci-dessous) montre comment des casques bleus, des FRCI, et des autorités préfectorales sont restés bien en retrait, impassibles à la sauvagerie qui se jouait sous leur yeux, à regarder et commenter le massacre des Wê par des miliciens RDR, qui, ayant d’abord mis le feu au camp, l’ont ensuite encerclé pour équarrir à la machette et assommer au gourdin quiconque tentait de sortir de la fournaise. 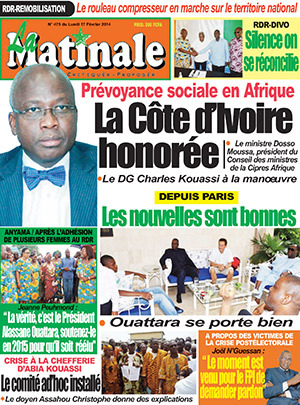 Dans leur toute dernières éditions, les « journaux » d’obédience RDR (le parti au pouvoir en Côte d’Ivoire) ont tenté un coup de force médiatique qui n’a eu d’effet que de dévoiler le manque d’ingéniosité des alchimistes en communication du régime dictatorial d’Abidjan. 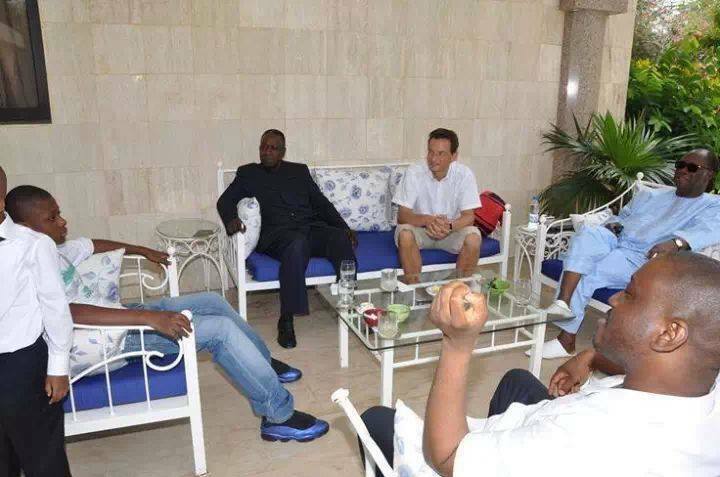 Affichant à leur « Une » une photo de Dramane Ouattara en boubou et lunettes fumées, recevant des visiteurs en tenues d’été (shorts, chemises à manches courtes), tous assis à un patio visiblement ouvert aux éléments, et baignant dans une luxuriante végétation de palmiers et d’acacias, les journaux de la dictature titrent : « Les nouvelles sont bonnes ; Ouattara se porte bien ». Ainsi, l’image est censée être celle de Dramane Ouattara en convalescence à Mougin, en plein hiver français. Et pour nous qui marchons et pensons gangasrotogati et non kurmagati, cette falsification qui voulait faire croire que l’hiver français s’est mué en été ivoirien avec l’arrivée de Dramane en France n’a illustré en fait qu’un Dramane visiblement très affecté ; et cela bien avant la falsification, bien avant sa toute dernière « opération de la sciatique ». Après l’écrivain français qui, se transmutant en chirurgien, qui nous fit un exposé magistral sur « l’excellente santé » de Dramane, voici les griots de la dictature, qui pour la convenance de la même cause, nous importent un été ivoirien à Mougin … en plein hiver. Les dozos ont, à n’en pas douter, des pouvoirs magiques. UNITED NATIONS (United States) (AFP) – Ivory Coast sent hit squads to Ghana to kill followers of former strongman Laurent Gbagbo and paid Liberian mercenaries not to stage cross-border attacks for Gbagbo, a UN report said. The Ghana government told United Nations sanctions experts they had « foiled » at least two missions this year by Ivory Coast agents to kill or abduct Gbagbo associates, said the report obtained by AFP Sunday. Payments were made to Liberian mercenaries and Ivory Coast militia commanders in a bid to head off attacks aimed at destabilizing President Alassane Ouattara’s government. The report to the Security Council by experts who monitor UN sanctions against Liberia cast new light on efforts by Ouattara’s government to blunt the threat from Gbagbo, whose refusal to concede defeat in a 2010 presidential election sparked unrest in which thousands died. Gbagbo is now at the International Criminal Court in The Hague facing charges of crimes against humanity. But several cross-border attacks were staged from Liberia in 2012 and the UN mission in Ivory Coast has said several times that new incidents are possible. The Ghanaian government told the UN experts in July that its neighbor had been sending Ivorian agents intending to assassinate or kidnap militant pro-Gbagbo refugees. « The Ghanaian authorities claimed to have foiled at least two such missions in early 2013, » said the report. At least one former Gbagbo supporter who had returned to Ivory Coast « had been abducted and had disappeared, » it added. The experts said they had been unable to « independently verify » the claims. Two of the mercenary leaders were identified as Isaac Chegbo, who is also known as « Bob Marley » and Augustine « Bush Dog » Vleyee. Money was paid for « collecting information from these individuals and discouraging them from conducting cross-border attacks, » said the report. It said the payments were made by the Ivory Coast interior ministry’s bureau of operational intelligence. Seven peacekeepers were killed in one cross-border attack from Liberia in June 2012. The border region has been quiet this year, however, despite fears raised by the UN leadership. The mercenaries told the UN sanctions experts they were taken to Abidjan to receive money. One said he was given $8,000 but others said they got as little as $2,000. « Several of the mercenaries who had received such payments complained that they had been promised substantially more money, » the report said. The mercenaries « alleged that additional financing had been misappropriated by Ivorian officials » and the Liberian intermediary. The UN report said that while attacks had diminished this year, the payments were not a « sustainable » way of keeping the lid on tensions in the country. It also said Ivory Coast had failed to tell Liberian counterparts about the payments or other moves to sway Gbabgo followers in Liberia. An Ivory Coast mission accompanied by a UN official from Abidjan that went to a refugee camp in Liberia in May was briefly detained by Liberian authorities who had not been warned in advance, said the report. 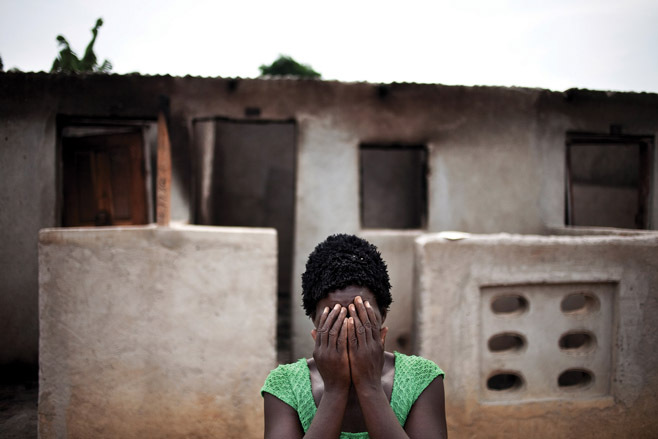 A woman hides her face after recounting how pro-Ouattara forces killed two of her children and her brother. (Abidjan)– The Ivorian government has not yet delivered on its promises of impartial accountability for the serious international crimes from the 2010-2011 post-election crisis, Human Rights Watch said in a report released today. The government should step up support to judges and prosecutors handling these cases so that victims from both sides can finally see justice. The 73-page report, “Turning Rhetoric Into Reality: Accountability for Serious International Crimes in Côte d’Ivoire,” analyzes Côte d’Ivoire’s uneven efforts to hold to account those responsible for serious international crimes committed following the November 2010 presidential election. Since his May 2011 inauguration, President Alassane Ouattara has repeatedly declared his commitment to bring all of those responsible to account, regardless of political affiliation or military rank. 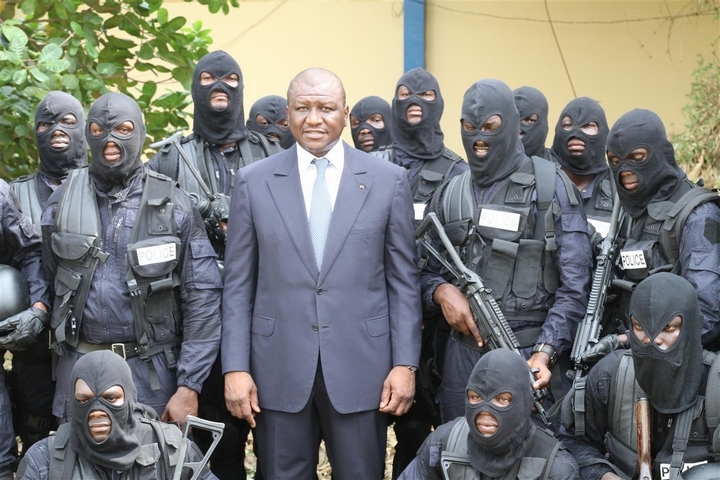 However, while prosecutors have charged more than 150 people with crimes committed during the post-election violence, none of those charged come from the pro-Ouattara forces. Côte d’Ivoire’s international partners – including the European Union, the United Nations, France, and the United States –should also increase diplomatic pressure and financial support for impartial accountability, Human Rights Watch said. The report is based on research in Abidjan in September 2012 and follow-up interviews with government officials, lawyers, civil society members, UN representatives, diplomats, and officials from donor agencies. Internationally recognized results proclaimed Ouattara the winner of the November 2010 election, but Laurent Gbagbo, his opponent, refused to step down as president. That caused a five-month crisis during which at least 3,000 people were killed and 150 women raped, with attacks often carried out along political, ethnic, and religious lines. In November 2011, Gbagbo was transferred to The Hague on a warrant from the International Criminal Court (ICC). He remains there in custody pending a determination of whether there is enough evidence to try him for four counts of crimes against humanity. Cases involving serious international crimes can be sensitive, but the lack of justice can carry high costs. Chronic impunity has fed the repeated episodes of violence in Côte d’Ivoire over the last decade, with civilians paying the greatest price, Human Rights Watch said. In June 2011, Ouattara created a National Commission of Inquiry, a Special Investigative Cell, and a Dialogue, Truth, and Reconciliation Commission to respond to the abuses committed during the post-election crisis. In August 2012, the National Commission of Inquiry released a summary of its report, which confirmed that serious crimes had been committed by pro-Gbagbo and pro-Ouattara forces, and recommended bringing those responsible for abuses to justice. These findings echoed a UN-mandated international commission of inquiry and reports by human rights groups. Human Rights Watch called on the Special Investigative Cell, which is tasked with conducting judicial investigations of the post-election crimes, to use the National Commission of Inquiry’s report to conduct a “mapping exercise.” The exercise would essentially be an in-depth overview of the crimes committed by region during the crisis, pinpointing individual suspects where possible. This would help the cell develop a strategy for selecting cases to investigate and prosecute, which it has not yet done. Non-confidential portions of any “mapping exercise” and prosecutorial strategy should be shared with the public to help build confidence in the investigative unit’s ability to execute its mandate independently and impartially. The Special Investigative Cell likely needs more staff if it is to succeed in bringing impartial prosecutions for serious international crimes, Human Rights Watch said. Human Rights Watch found that many people accused of post-election crimes have sat in pretrial detention for almost two years, in violation of their internationally recognized fair trial rights, in part as a result of the need to enact long overdue legal reforms. The government should expedite efforts to reform the criminal procedure code so that defendants already in custody can be brought to trial without further delay and are guaranteed a right of appeal. Access to a lawyer should also be made mandatory at an earlier stage, as well as legal assistance for those who cannot afford a lawyer. ICC states parties, the EU, and the United Nations notably have increasingly signaled their commitment to promote accountability before national courts to make complementarity – the principle under which the ICC only intervenes when national courts are unable or unwilling to do so – a reality. However, the Human Rights Watch report sets out evidence that key partners have only made limited efforts toward those ends in Côte d’Ivoire. Côte d’Ivoire’s international partners should learn from the mistakes made following the country’s 2002-2003 armed conflict, Human Rights Watch said. After the earlier conflict, the country’s international partners sat by silently while justice was sidelined and impunity took deeper root, helping set the stage for the devastating post-election crisis in 2010 and 2011. The Ivorian government and international donors should also work together to support the independence of judges and prosecutors, and to provide protection and security for witnesses, judges, prosecutors, and defense lawyers involved in cases of serious international crimes. This is of critical importance to ensure fair and impartial justice for the key crimes of the recent past, and to strengthen the Ivorian justice system overall so it can function efficiently and fairly in the future, Human Rights Watch said. Following requests by both the Gbagbo and Ouattara governments to investigate the violence in Côte d’Ivoire, the ICC opened an investigation in October 2011. The ICC has jurisdiction to try crimes committed in the country after September 19, 2002. The ICC has only publicly issued two arrest warrants, against Gbagbo and his wife, Simone, both charged with crimes against humanity. The Human Rights Watch report concluded, based on interviews with numerous Ivorian civil society activists, that the ICC’s one-sided approach has legitimized the same approach by Ivorian judicial authorities and undermined perceptions of the ICC’s impartiality. Côte d’Ivoire ratified the Rome Statute, the ICC’s founding treaty, in February 2013, becoming the ICC’s 122nd state party. Simone Gbagbo remains in Ivorian custody facing domestic charges of genocide, among other crimes. The Ivorian government should comply with its obligations either to surrender her to the ICC or, as an alternative, submit a challenge to the admissibility of the case before the ICC because she is being tried for similar crimes domestically. Alassane Dramane Ouattara n’est plus en odeur de sainteté à Washington. 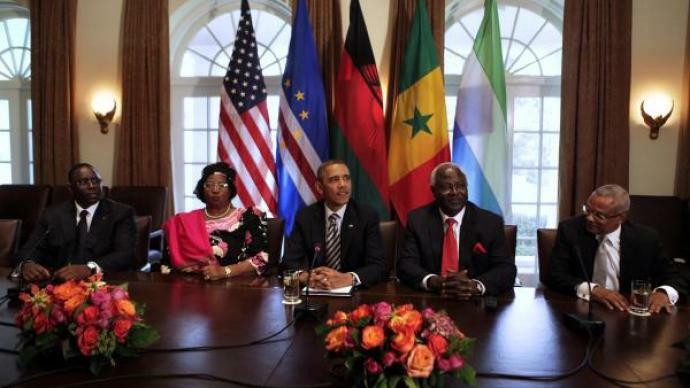 Le chef de l’Etat américain, Barack Hussein Obama, qui recevait quatre dirigeants africains considérés comme étant parmi les plus « démocrates » en Afrique, a pris soin d’éviter que les effluves des multiples charniers du Boucher d’Abidjan ne viennent polluer les bords du Potomac. Dramane n’a pas reçu de carte d’invitation. Il n’est certainement plus au nombre des « New Best Friends » du président américain. Finies les embrassades et les chaudes poignées de main de 2010. Dramane n’est plus le bienvenu dans la « cour des démocrates ». Il n’est plus fréquentable. Le temps, l’autre nom de Dieu, a fini par le révéler à tous ceux qui naguère le supportaient avec enthousiasme, que cet homme qui trône en maître absolu sur la Côte d’Ivoire peut être pire que Macias N’Guéma et Idi Amin réunis. Mieux vaut ne pas se souiller de sa Compagnie. Et Dramane, qui toujours se trouve une activité alternative pour camoufler le fait saillant de ses revers, est rentré à Mougin lécher ses plaies, prétextant un besoin pressant de repos ; comme pour dire « j’aurais pu être à Washington, si je n’avais grand besoin de repos ». Le Professeur Aké Ngbo, le tout dernier Premier Ministre du Président Laurent Gbagbo, est enfin sorti des geôles du Boucher de Duékoué, après 20 mois d’une détention illégale. Avec sept autres de ses compagnons, il a été libéré, non pas à la suite d’une procédure judiciaire en bonne et due forme, mais plutôt sur un coup d’humeur du despote d’Abidjan, dont les caprices ont force de loi dans cette république qui avance à reculons. Alors que les griots de la Rattrapocratie s’attendaient à ce que ce grand homme bêle à la mesure de leurs darboukas et fasse ses circonfessions au Boucher de Duékoué, le Professeur Aké Ngbo, arborant au cou cette synecdoque, cet emblème désormais distinctif de la lutte émancipatrice du Président Gbagbo, comme pour dire que la lutte continue, exprima en peu de mots dosés d’une détermination sans failles les revendications principales des Ivoiriens : la nécessité de libérer tous les acteurs politiques injustement disséminés dans les camps de concentration du Boucher et la libération du Président Gbagbo, conditions sine qua non d’une réconciliation vraie et d’une paix durable.